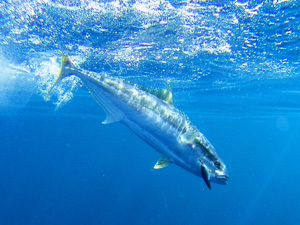 Yellowtail kingfish are a highly sought after recreational sports fishing species mainly due to their fighting ability and eating qualities. Since around 2010, targeting yellowtail kingfish has increased in Victoria with a wide size range of fish taken from Portland to Mallacoota. In Victoria, fundamental stock structure information is limited on this re-emerging fishery. However, with increasing fishing pressure it is important to understand the biology and structure of the stock. 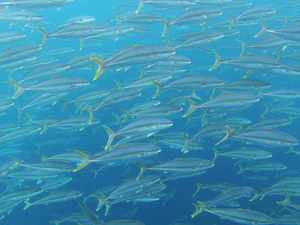 Determine whether yellowtail kingfish caught in Victorian waters are from a single or multiple stocks. Define population characteristics (age and growth, size structure, spawning characteristics) of Victorian yellowtail kingfish. Determine the future potential of this fishery using historical recreational catch information. Trial the use of satellite tags as one method to understand movement characteristics (spatial, depth, temperature preference) of yellowtail kingfish. Trial otolith (earbone) chemistry analyses as a method for investigating yellowtail kingfish temperature preference. Information such as spatial and temporal stock structure (i.e. where and when do we see them), spawning age and growth data are basic knowledge requirements used to assess the status of the current population. This information will help us understand the productivity of the fishery and improve our management strategies that aim to enhance its potential. The success of this research project is largely due the involvement of recreational anglers and the charter boat industry. Scientific clerks actively liaised with both groups to obtain catch statistics and collected over 450 kingfish frames. All frames have been dissected, otoliths (earbones) removed for ageing and reproductive condition assigned. Researchers from NSW and Tas have collaborated with Fisheries Victoria to define the genetic stock structure. Initial results revealed that they are likely to be from a single stock which is indicative of a species that move large distances and whose eggs are larvae are distributed widely by oceanic currents. It is well known that kingfish are fast growing so it will be interesting to analyse growth information compared with fish from other states and determine their size at maturity. During May 2017 a 'rat' kingfish (about 65cm) was satellite tagged off Julia Percy Island (near Port Fairy, Vic). The tag is set to be automatically released from the fish at the end of June. Such information will be used to help determine if kingfish move from Victorian waters during winter. It will also show depth and water temperature preferences during its time at liberty.